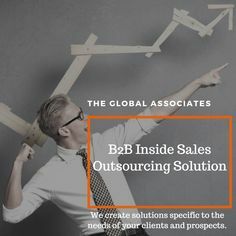 The Global Associates Telesales Companies constantly strive hard to reach out to prospective buyers and try to convince them about the suitability of their products for their purpose. Taking the full advantage of every single business lead in hand is very important for telesales companies in this era of ever-intensifying global competition and well-informed customers. The key to success lies in managing the sales pipeline rather than concentrating only on generating fresh leads. Business prospecting can sometimes take a backseat as organizations are closing deals. It’s necessary to realize that no business can survive without prospecting; you must devote sufficient time to making calls and trying to reach out to new prospects. Deals will dry up if there are no fresh leads to fill up the sales pipeline. Having good back-up clients helps in case you lose a big client. A routine analysis of your sales pipeline is essential to ensure that the process is working well. Getting careless by a big client making up your sales figures is a normal tendency, however, neglecting lead nurturing could be a costly mistake. It’s necessary that telesales companies work meticulously to improve their conversion rates, there is just no other option. If you become lazy, sales leads will stagnate; prioritize your leads and focus more on more promising leads instead of wasting time on the ones that don’t seem that promising. Telesales companies must devise ways to overcome the challenges they face in their effort to try to get bigger and more successful. Identifying the main issues and working to improve their shortcomings can ensure their inclusion in the big league.